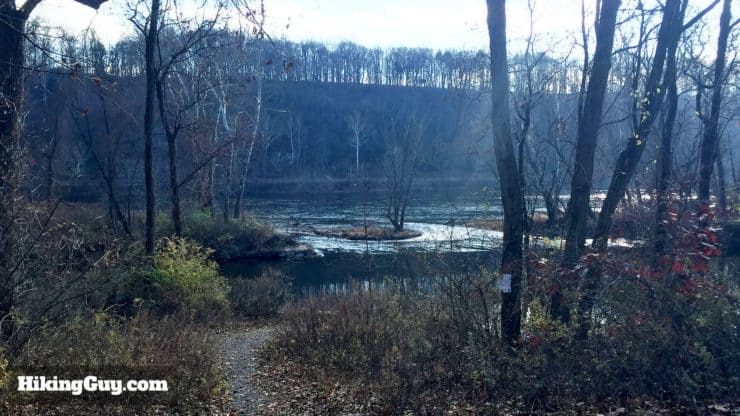 This hike from Stockton, NJ to Bulls Island State Park takes you on a loop through NJ and PA along the Delaware River Trail, following a historic rail line and offering great river and wildlife views. 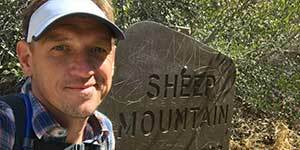 Don’t let the length put you off, it’s very flat and a great hike for beginners. And you can do it on a bike too if you prefer. 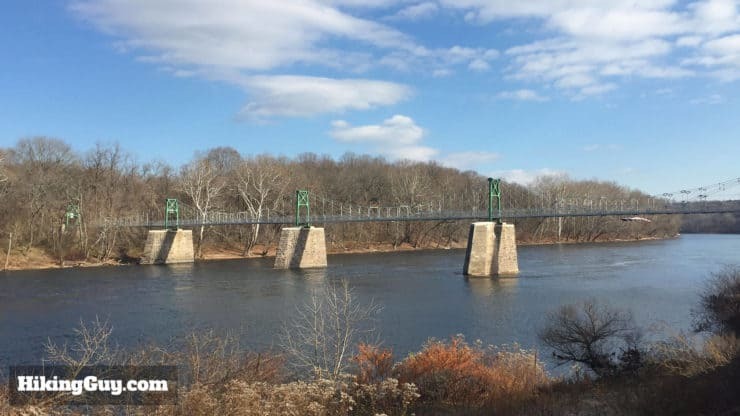 The Delaware River Trail is not only great because of it’s scenic properties, but it’s also noteworthy historically. 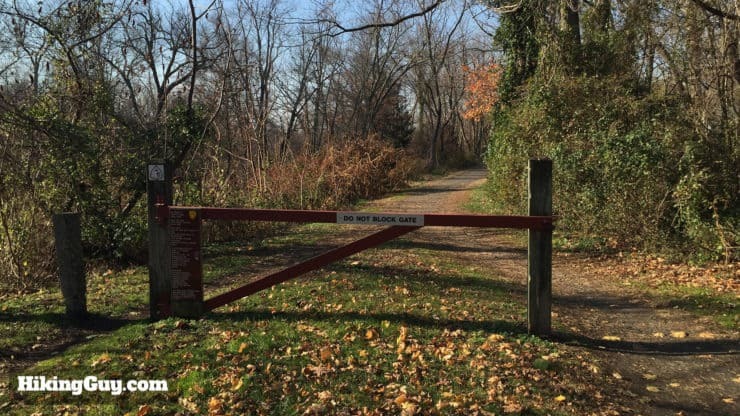 The New Jersey side was home to the Belvedere Delaware Branch of the Pennsylvania Railroad, and you’ll see relics of the railroad along the hike. 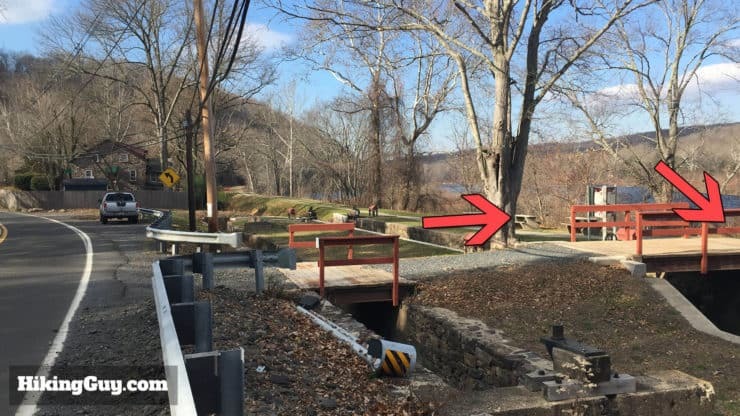 Keep your eyes open for old rail bridges and mile markers, which could date back to the railroad’s start in 1851. The railroad connected this area with New York and Philadelphia (via the end of the line in Trenton). 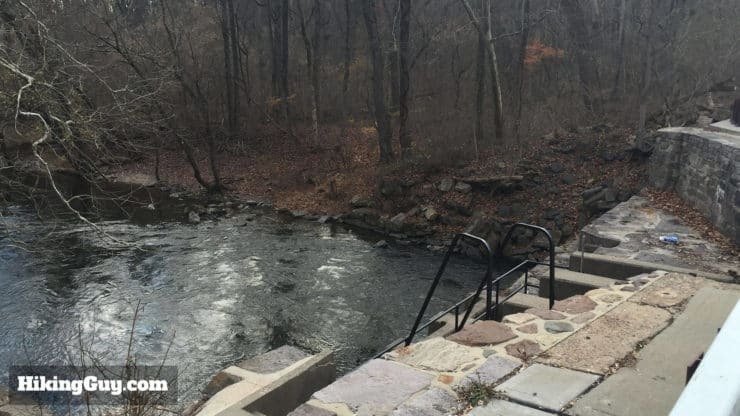 This peaceful hike was once a busy thoroughfare, with trains and barges hauling coal and iron ore to factories in Northern New Jersey. 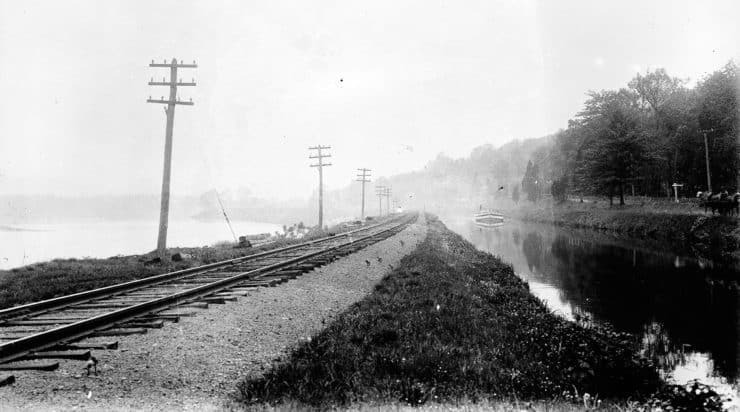 This photo dates from 1912, and you can see that barges were still in use then. Photo Richard Burton. Before the railroad you had the canals, which the Delaware River Trail goes along. 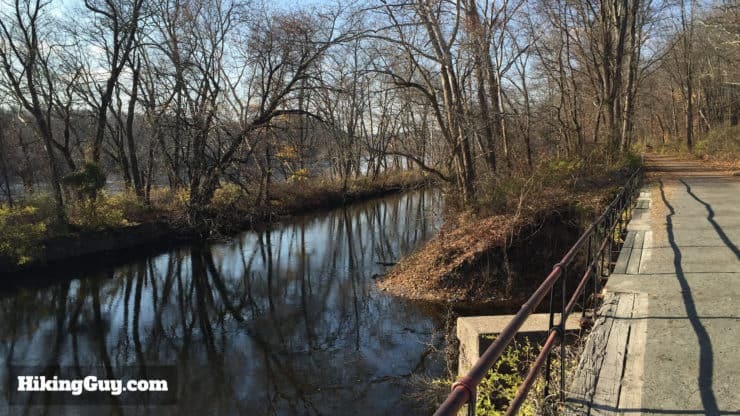 The canal on the New Jersey side is the Delaware and Raritan Canal, which connected the industrial areas of Phillipsburg and Easton to New York (by going down the Delaware to Trenton, and then down the Raritan River to the ocean). The canal was built in 1834, eventually going out of use in 1932. 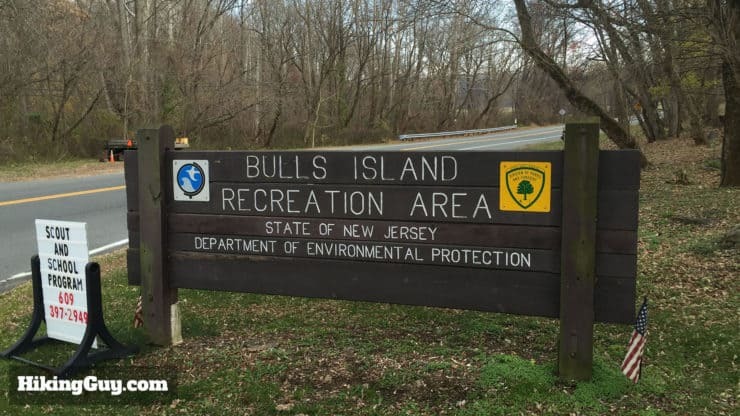 If you want to learn about the history of the area, you’ll have an opportunity at Bull’s Island State Recreation Area, a 79 acre portion of the larger Delaware and Raritan Canal State Park. There’s an office open during business hours that has a nice historic display on the building of the canal. 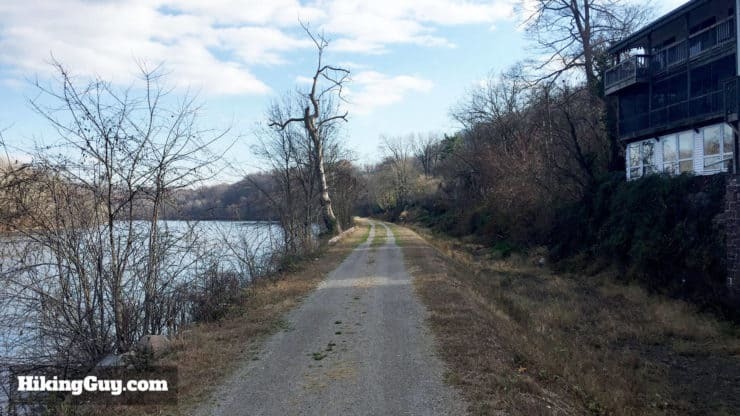 Bull’s Island also offers picnic grounds, fishing, and a boat launch. The hike starts in scenic Stockton, NJ, where there are a few options to grab some food before or after the hike. From Stockton the hike goes up the Delaware River Trail to Bulls Island State Park, then across the river on the walking bridge, and then back down on the PA side. 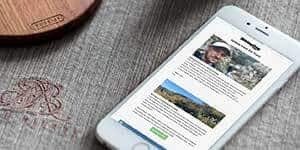 Use this address for the trailhead: 2 North Railroad Avenue, Stockton, NJ, 08559, USA. There are free spots along the trailhead, and there’s free street parking in Stockton. The big lot across from the trailhead is private, so heads up. 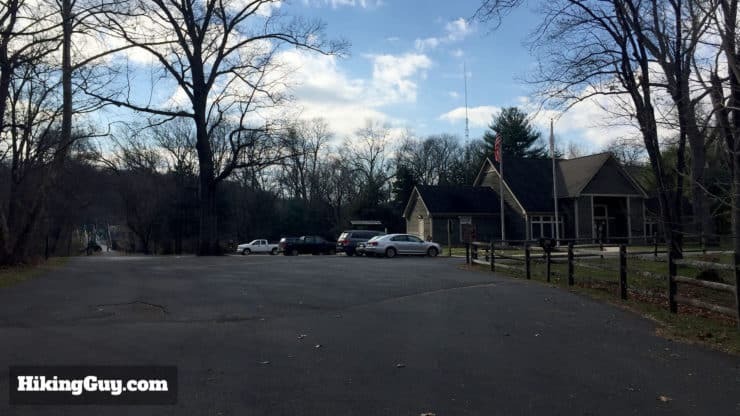 If you want to use the bathroom, you’ll have to find somewhere like a restaurant in Stockton, or use a porta-pottie at Bulls Island, which has limited facilities. People used to be able to camp at Bulls Island State Park, but they shut it down after a branch fell and killed a camper a few years ago. 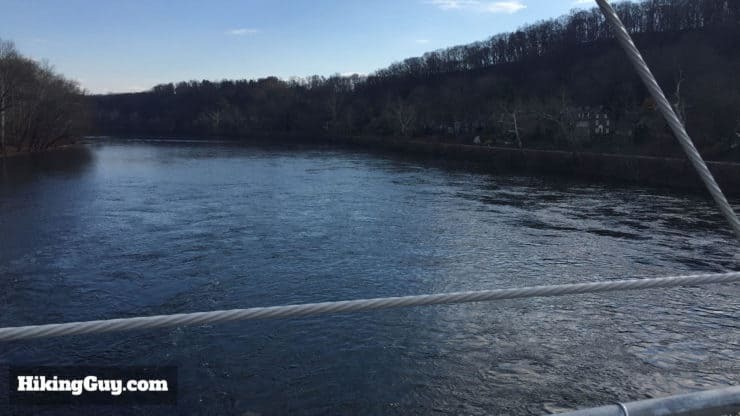 It sounds a bit extreme, but the problem is that the Delaware River often floods in the winter, depositing lots of debris and weakening branches. Having to inspect every tree every year is just too much work given their funding. So the campground will be restored to native habitat. 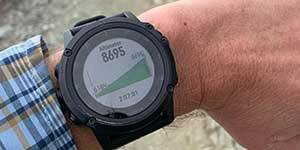 This isn’t a technical hike, and you can do it in fitness or street clothes, but fitness clothes will work better. It is longer, so bringing water and snacks is smart. Aside from the start/end in Stockton, there are no places to buy snacks. If you do this hike in the warmer months, I recommend taking bug spray. There can be gnats and mosquitos. 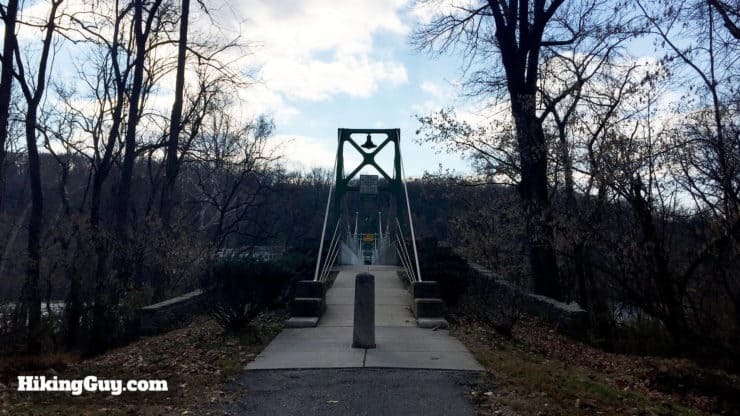 The Delaware River Trail offers tons of wildlife viewing, mainly birds. 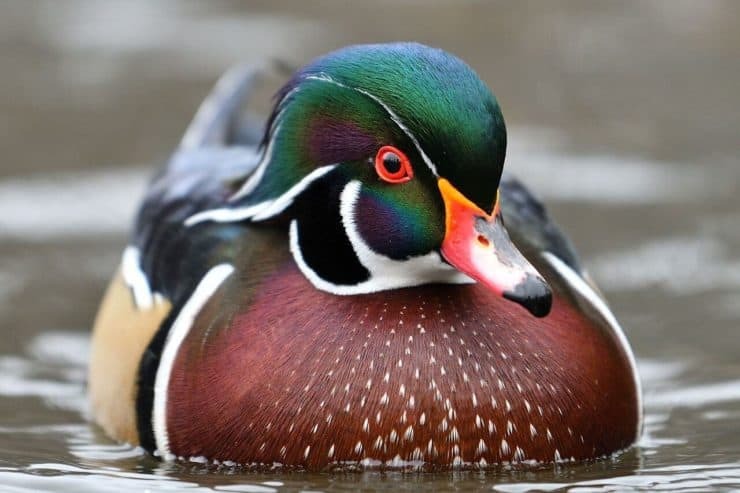 In addition to many types of duck, keep your eyes open for red-tailed hawks, kingfishers, cliff swallows, and in the winter, bald eagles. This is where binoculars can come in handy. 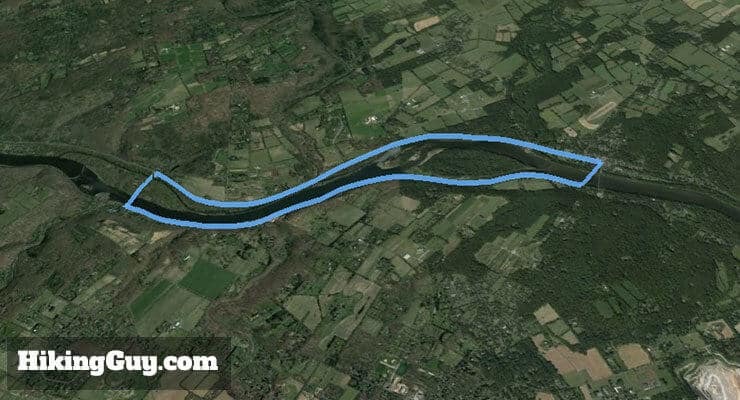 This hike does a loop on the PA and NJ sides of the Delaware River trail. 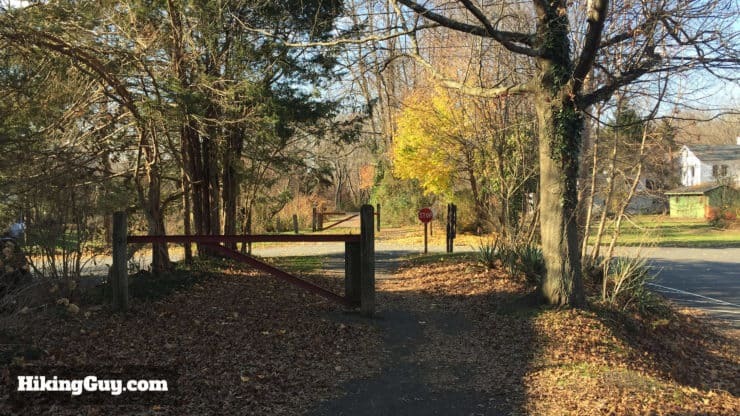 The trailhead is next to the Delaware River Trail in Stockton, NJ. Once you park, walk north on the well marked trail. As you can see, the Delaware River Trail is wide and easy to follow. Make your way through the gate and cross the road, continuing to hike straight. The Delaware River Trail continues through the back of residential Stockton. Keep hiking straight. Shortly you’ll reach Prallsville Mills. Some of the buildings date back to 1720. 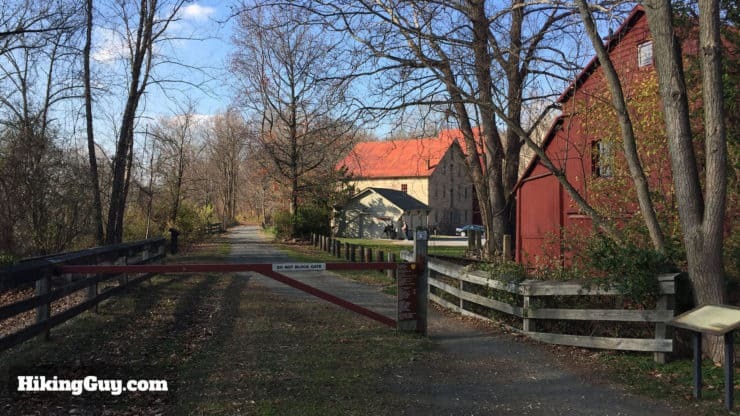 I’d recommend checking out the Prallsville Mills website to see if there are any tours or events happening when you pass through. The website also has a ton of interesting information on the history of the mill. 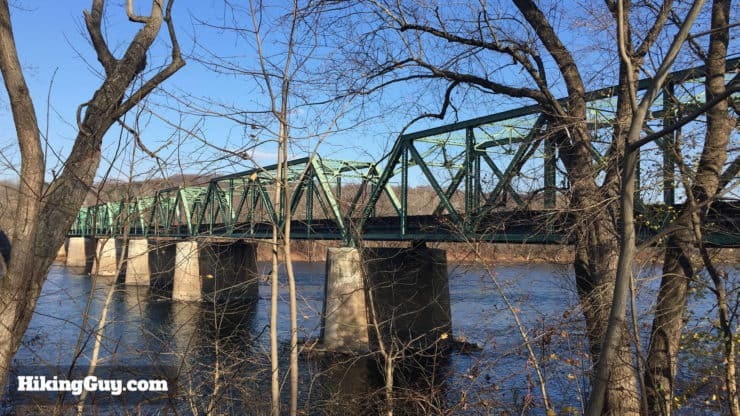 Across the trail from Prallsville Mill you get some great Delaware River views. After the mill, you continue straight on the well-defined Delaware River Trail, eventually reaching a bridge over a creek. 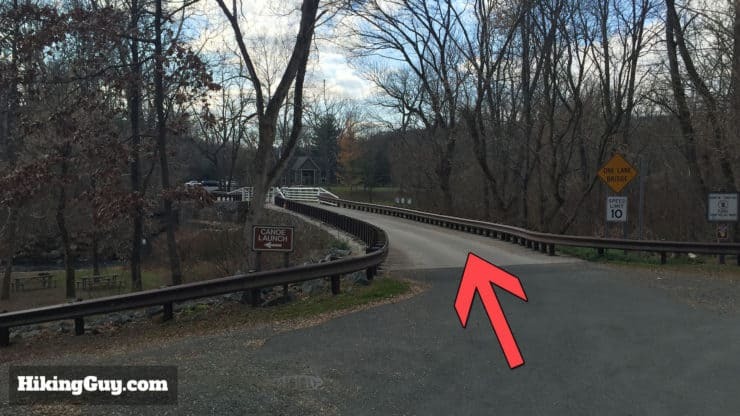 If you want to explore the creek and river, there’s a side trail before the bridge that fisherman use. Shortly after the last bridge, your’ll reach Bulls Island State Park. Actually it’s a State Recreation area but most people call it a park. Turn left into the park and follow the road to the main parking area. The bridge crosses some swift water. You can see people here fishing for bass, trout, and perch. Continue through the main lot at Bulls Island. If the office is open, you can go in and check out the historical exhibition on the building of the canal. Avoid any side trails to the left. Head across the parking lot and cross the walking bridge. 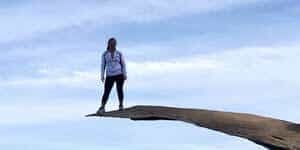 Crossing the walking bridge is a highlight of this hike. Soak in the views. 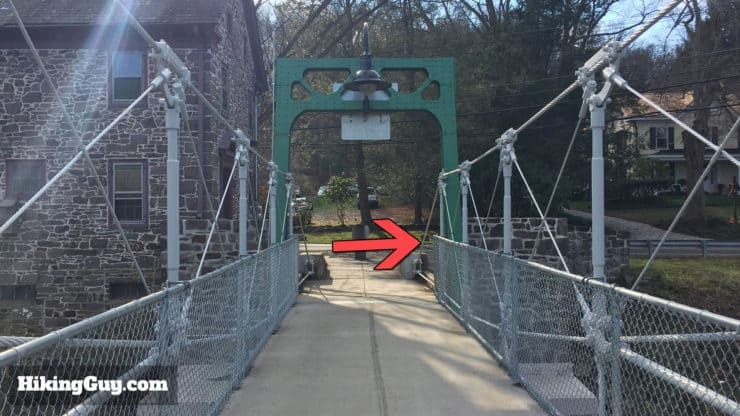 The Bulls Island walking bridge was originally built in 1856 and was a covered bridge. The Delaware River often floods in winter and spring, and parts of the bridge were destroyed in 1903. In 1947 the bridge was rebuilt as the pedestrian bridge you see now. The stone pillars supporting the bridge still date back to 1855. 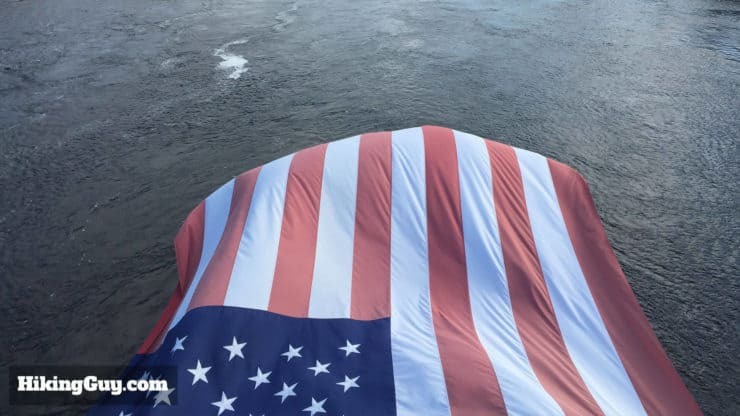 There’s often a huge flag flying from the bridge. A good spot for a selfie or photo. 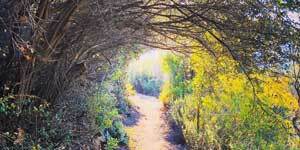 After the bridge, you (counterintuitively) make the right. 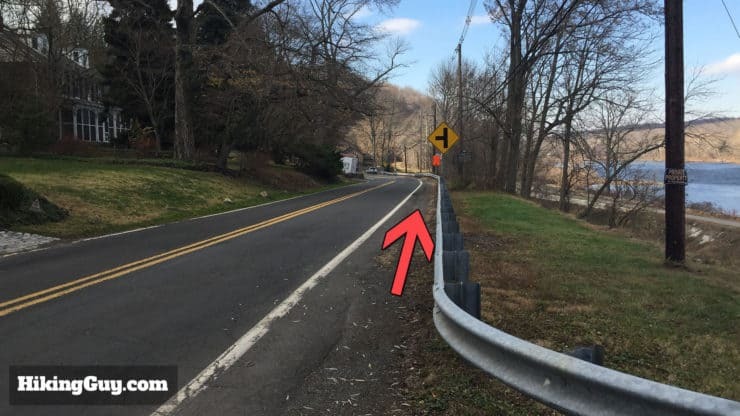 Follow the side of River Road for a short stretch and watch out for traffic. 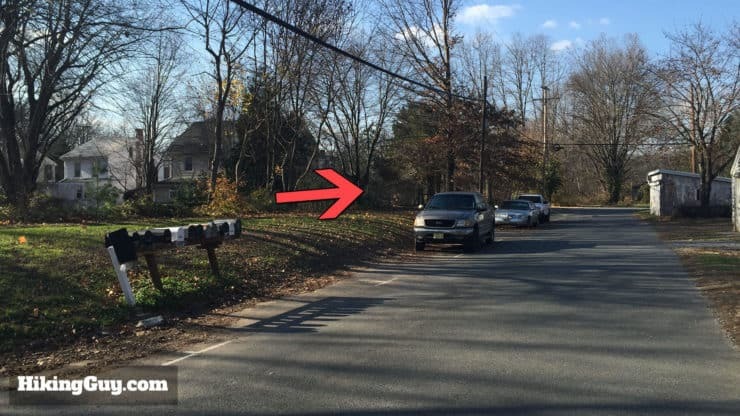 Keep your eyes open for the historic markers along the road. 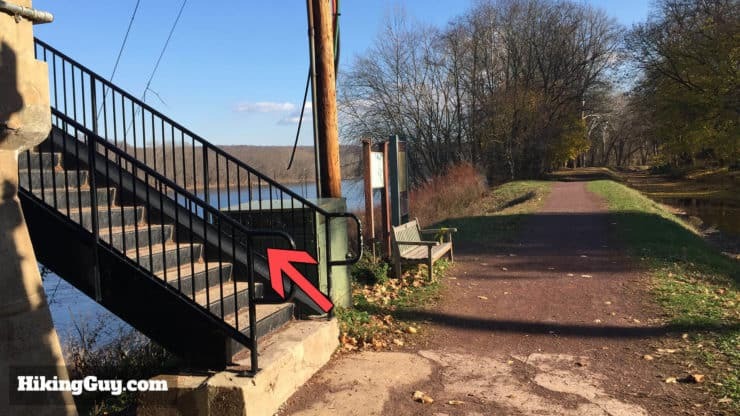 When you reach the lock, cross over to the Delaware River Trail, and make the right to head back down the river, back toward Stockton. The lock is an interesting place to look around too. 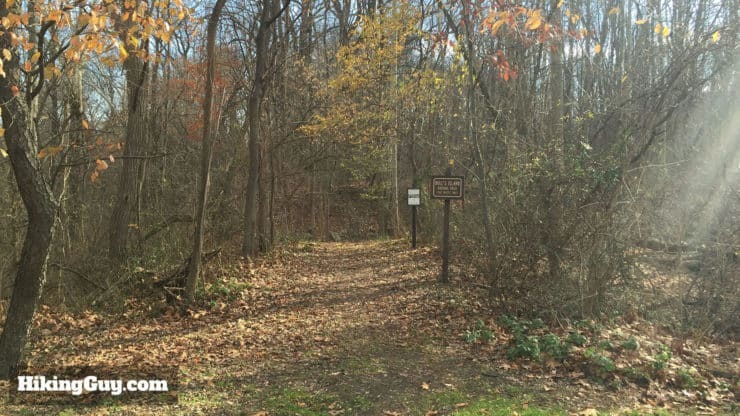 This part of the hike goes down through Delaware Canal State Park. 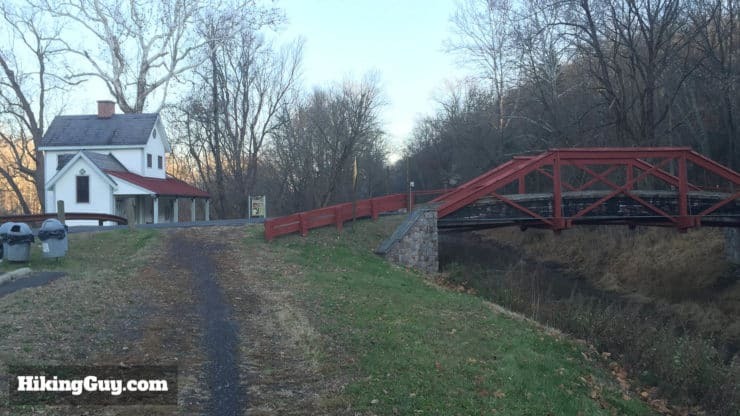 The Delaware Canal runs from Easton down to Bristol (across from Trenton), and was first opened in 1832. 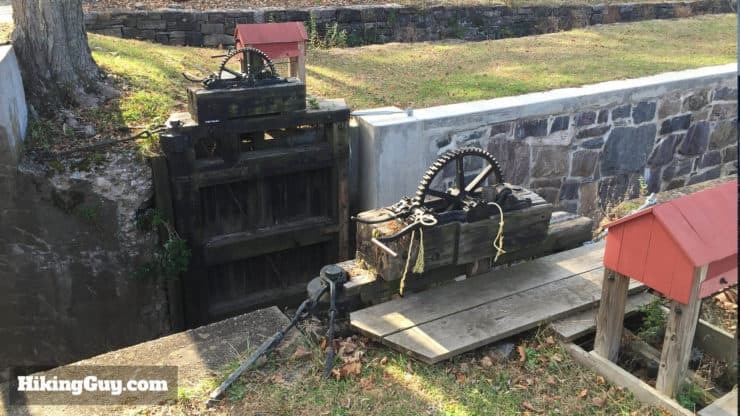 The locks you see allowed the canal to handle changes in elevation. 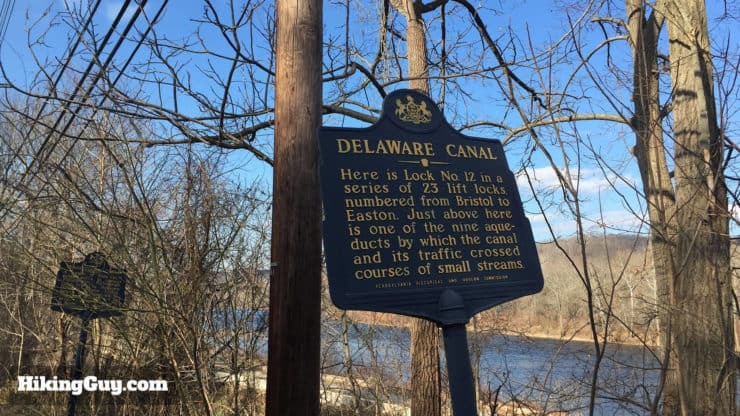 After the lock, head back south on the Delaware River Trail. You’ll get unobstructed views of the bridge here. 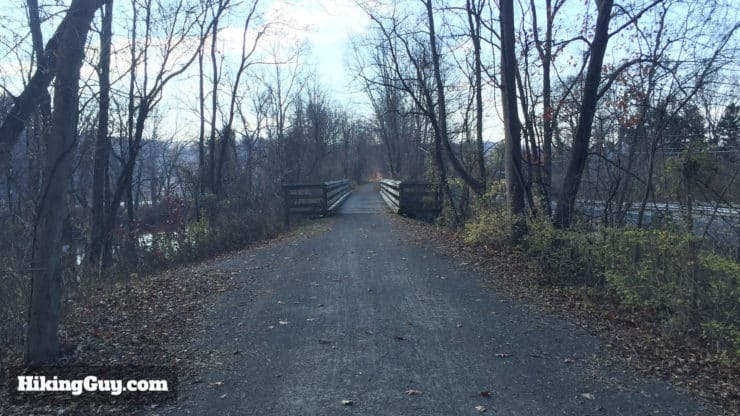 Similar to the NJ side, the PA Delaware River Trail is straight and easy to follow. Recreation Area, where there are bathrooms and water fountains. At around 7 miles you’ll see the Stockton Bridge coming back into view. Almost done. 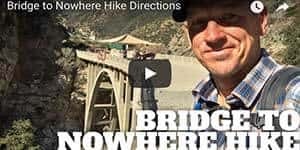 Climb the stairs under the bridge, head back to NJ, and finish the hike.